a while to register that I need to open up to possibility again. – and really dream: visualise, feel, touch, smell, enjoy, taste what your happiest ways of being feel like. Let your body be absorbed with it, adding details, activities, scenarios that open up your life and relationships. Dream into how you want to be connecting with those in your life, new areas you want to expand your confidence into, abilities you want to develop. Let it all bring smiles to your face and don’t worry about letting practical considerations to be part of this first step. – perhaps as a vision board, or maybe buy some new object, picture, image, poem or plant that symbolises the new and its possibilities. Put this in a key spot. Take your time to chose this and make sure it resonates with your deepest longings and wishes. These can include both your key responsibilities and those things that are truly lifesavers for you – e.g. walking daily, spending time with your partner, core ways of looking after your children, friends who play a big part in your life. While you are doing this, stay true to your needs so they don’t get swamped by the needs of others’, as this is so easily done. See this link for setting boundaries that respect and honour your needs. If you don’t prioritise your health and well being you are setting yourself up for over-tiredness, resentment and dissatisfaction – and not a new start! Can you spend less time on something? Can you find more efficient ways of doing another? Can you ask for help or barter tasks with others? Can you add in a simple fun or relaxation factor to one of these tasks? This is an easy shortcut to small but valuable moments well being. They add up and can make your day. As you do this, be aware of which part of you is prioritising this list. Sometimes at this stage a primary self can take over – a part of us that automatically runs our life, eg the Responsible Organiser. If this happens, we may soon feel stuck and restricted again and push needs aside that are not part of this self’s agenda. For example, being the organiser (of our own or others’ lives) can quickly take over our day and we simply run out of time for – well, everything else! For more on parts of ourselves that can be running us without our being fully aware of it see voice dialogue. This kind of life balance issue can be a huge challenge these days – but you are in charge! First link in with those things for which you feel gratitude – small or large. Many people write a regular gratitude list of 5 things each day. Include things you are grateful for in yourself too – your skills, beliefs, qualities, the gifts you offer others and the ways you contribute. Then look at your vision board or new start symbol and recreate that feeling of happiness it gives you. From this quiet space, list your tasks, attitudes and orientation for the day ahead. You are starting the day with a feeling of well being, tuned into your own wisdom and needs and knowing how best to support yourself for the best possible day. Even in very tough times, this daily time of orientation can add tremendously to your feeling supported in your life. Let yourself be fed by life – it is vast and rich: when we remember to look up from the tangle of problems, overwhelm and practicalities that can get us bogged down, we can find help, inspiration and strength to handle that moment and the next step ahead. Don’t give up – keep on looking if help doesn’t come immediately. Don’t forget to ask for help and support in clear and practical ways in the areas where you are less strong. No man or woman is an island – allow the warmth of kindness from others to come in. Spend time with those who support you and acknowledge your strengths. Each day, and even each moment can be a new start. You came here to be you. 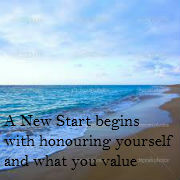 Honour and respect yourself and step into possibility.